Home / appliances / sale / samsung / Samsung Merry Christmas deals Promo save up to 36,000. Samsung Merry Christmas deals Promo save up to 36,000. Samsung Philippines offers a merrier and hassle-free Christmas with generous discounts and some freebies on Samsung Digital Appliances through the Merrier Christmas Deals promo. Customers can save up to P36,000 or 25% off on the latest Samsung Digital Appliances for straight payments and up to 15% off for installment purchases. Customers are also entitled to a dining treat at House of Wagyu or Marriot Hotel–Cebu when they avail of 0% Citi PayLite for 12 months with their Citibank Credit Card. 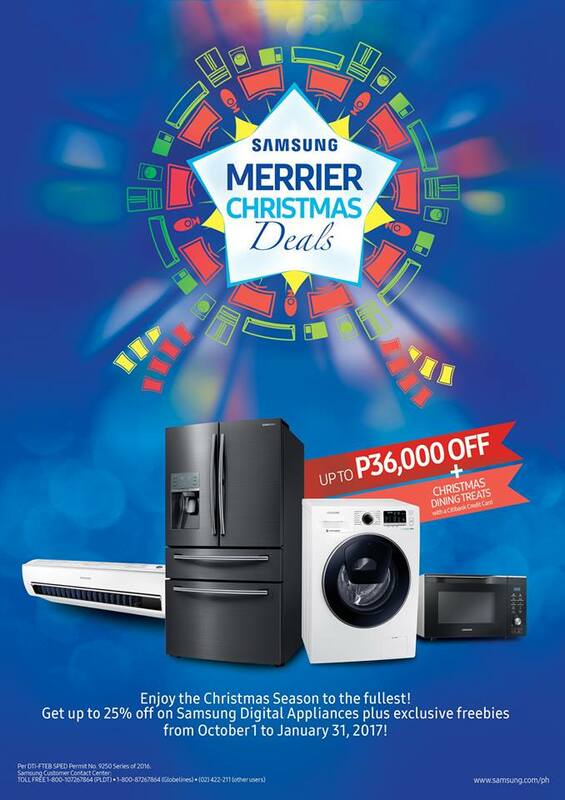 The Samsung Merrier Christmas Deals promo is available on a wide-range of Samsung refrigerators, washing machines, air conditioners, and microwave ovens.